Just like the V-450 model that we’ve already reviewed here, the Go Elliptical V-600 is one of the elliptical trainers from the “Vena” series. It shares many similarities with the V-450 model but does have several extra features, such as a cooling fan and a slightly heavier flywheel. 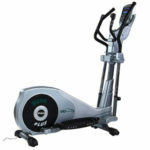 This unit is also referred to as the Go Elliptical V-600P or V-600 Plus. The Go Elliptical Vena V-600 Plus features a sturdy frame made of steel tubing. The main steel bars in the frame construction are double coated with a corrosion-resistant and abrasion-resistant paint finish, with the exception of the adjustable moving arms which have a chrome plating finish. The unit’s paint finish is gray, this being the only color available for this model. Also, along with the durable paint finish, most of the unit’s frame is concealed by ABS covers which prevent corrosive sweat from reaching the metallic parts. 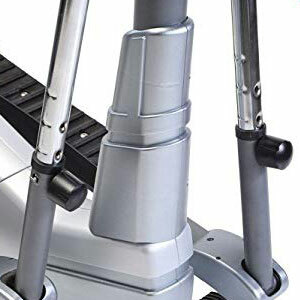 Although it’s not an extremely large elliptical trainer compared to others, such as the NordicTrack SE9i for example, the Vena V-600 still takes approx. 57″L x 28″W (145 x 71 cm) of floor space. On top of that, it is recommended to leave at least two feet of clearance on each side, and at least one foot of clearance at the front and rear for safe operation and ease of access. The fully assembled machine is rather heavy; it weighs approx. 134 lbs (61 kg). Therefore, its transport and assembly should be done by two persons. But on the other hand, once it is fully set up, its relocation shouldn’t be too difficult. Its front base has integrated transport wheels. 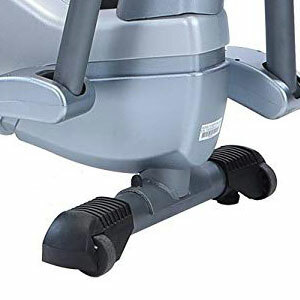 This elliptical trainer features two sets of handlebars, one mobile, and one fixed. The mobile handlebars have longer and curved grips allowing you to place your hands in different positions in order to focus different muscle groups. They have ovalized grips at the top. They are also adjustable; each bar has three adjustment positions. The fixed handlebars are equipped with pulse sensors. By holding on to them, the machine’s console can monitor your heart rate. They also integrate resistance controls. The unit’s pedals are attached to a set of heavy-duty bars, while the crank arms are also extremely durable. Therefore, the machine can support users up to 300 lbs (136 kg) with no problem. The pedals are made of heavy-duty ABS material. They have a ribbed surface in order to provide superior adherence. They do not have any extra articulation or cushioning, but they are adjustable. There is a foot stopper which can be placed in 8 different positions on the surface of the pedals, 4 positions at the front, 4 at the back. Last but not least, the joints between the moving parts of the machine integrate heavy-duty ball bearings. This being said, the unit provides a very smooth motion and the joints are less likely to develop squeaking noises. The GoElliptical V-600 features a mid-range stride of 17″ (43 cm). This being said, it’s a machine for users between 5’0″ and 6’0″ (153 – 183 cm). Taller users can still benefit from a consistent workout on it, but they won’t benefit from a full range of motion. As a general idea, a shorter stride is great for thighs and calves, while a longer stride puts more focus on the hamstrings and glutes. As we’ve mentioned above, the machine’s moving arms have three adjustment positions. This allows you to lock the pedal bars in a higher or lower position which results in a stride adjustment. 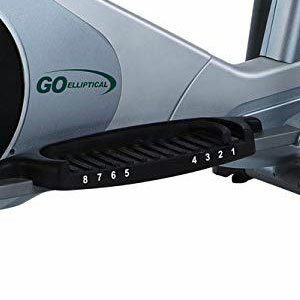 With the pedals connected to the bars in the lower position, the elliptical path is horizontal. Conversely, with the pedals attached at the highest position, the elliptical path will be slightly inclined backward, which results in a pedaling feel similar to walking up a soft ramp. At their lowest position, the pedals stand at approx. 6″ (15 cm) above floor level. Conversely, their highest point is at approx. 16″ (40 cm) above floor level. This being said, the pedal step-up height is somewhere in between, at approx. 10″ (25 cm). Thus, GoElliptical recommends using the machine in a room with a ceiling that is at least 20″ (51 cm) higher than your own height. This elliptical trainer is equipped with a heavier flywheel than the Vena V-450. It weighs 17.6 lbs (8 kg) and has a balanced structure in order to provide a steady pedaling motion. It also allows pedaling in reverse at the same selected resistance. Due to this, you can diversify your workouts. The unit’s drivetrain consists of a durable poly-v belt which eliminates vibration and provides an almost completely silent pedaling motion. Also, as opposed to a chain drive system, a belt drive eliminates the hassle of periodic lubrication. You won’t have to worry about taking off the covers every month to apply lubricant on the unit’s drive elements. 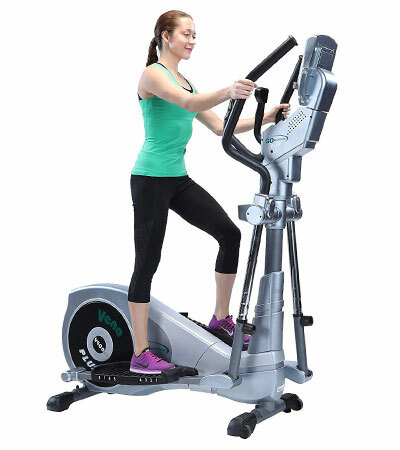 In terms of resistance, this Go Elliptical machine is equipped with an eddy current system. The resistance elements are a magnetic brake integrated into the flywheel and a small servo motor. The resistance can only be adjusted from the console, and the machine needs to be connected to a power source. An adapter is included for it. Also, the console features several preset workout programs, so when one of these is in use, the machine auto-adjusts the resistance. 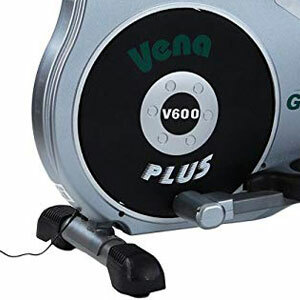 The Vena V-600 Plus elliptical trainer offers 24 levels of resistance. The first five levels deliver a light pedaling tension, great for users who have suffered from injuries, or for anyone who wants to perform a light workout. Conversely, the top tension levels allow you to put more focus on your leg muscles and achieve a high cardiovascular rate in a very short time. 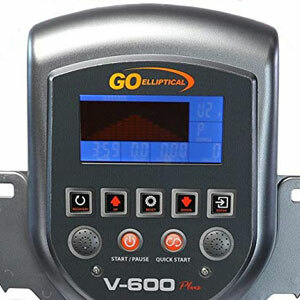 The console of the V-600 elliptical has the same type of LCD display as the one of the V-450. However, the keypad is different and it does not have a rotary element. The display is 5.5″ in diagonal; it is divided into several sub-sections and indicates time, distance, speed, calories, and pulse. The larger black/red section shows the program profiles. The console unit of the machine is not telemetric. This means it cannot read your pulse through a Polar, or other types of wireless HR chest straps. So, in order to benefit from a pulse reading or use the recovery program, you will have to hold on to the sensors integrated into the stationary handlebars. The machine does not have Bluetooth or online connectivity, nor it is compatible with any online fitness apps. However, it offers 24 programs to keep you motivated. It has a Random program which gives you the possibility to create your own workout profiles, save them, and re-use them for as many times as you want. It also has a Recovery feature which gives you a fitness score between F1 (excellent) and F6 (poor) depending on how long it takes your pulse to become normal after the workout. The console makes available four user profiles. Each user can save their own personal data such as body weight, height, gender, and age. Therefore, the unit will be able to provide a more accurate calorie value and recovery value. Apart from the workout metric tracking and fitness programs, the console also has a few extra features. These are the sound system, the cooling fan, and the tablet holder. The sound system consists of two small speakers placed one on each side of the unit’s keypad. There is an audio output to which you can connect your MP3 player, smartphone, or tablet in order to play your music through the incorporated speakers. The tablet holder consists of a small tray which attaches under the console display. And finally, the workout fan has its own housing under the main console. It’s not extremely powerful but does provide some cooling if needed during a more intense workout. The main body of the unit with all the drive and resistance elements comes already assembled. You only need to attach the base bars, the pedals, the console mast, the handlebars, the console, and several plastic covers. This may take more than an hour, but the manual provides pretty clear schematics and assembly instructions. Also, a basic toolkit for the assembly is included. The Go Elliptical Vena V-600 Plus is a mid-range elliptical machine made for home use. It integrates an eddy current resistance system with 24 tension levels and offers 24 workout programs. Its moving arms have three adjustment positions which allow you to adjust the unit’s stride. It’s a great trainer for cardio training, weight loss, stamina improvement, and muscle toning. And finally, even though it does not have an incline system and does not offer online connectivity, it still is a fairly decent machine for the price.